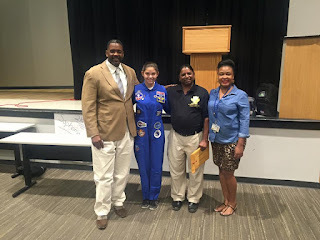 Standing from left are, St. Helena College & Career Academy Principal Reginald Douglas, NASA Blueberry Alyssa Carson, Science Teacher Prasanna Epuri and SU Ag Center Assistant Area Agent Nicolette Gordon. 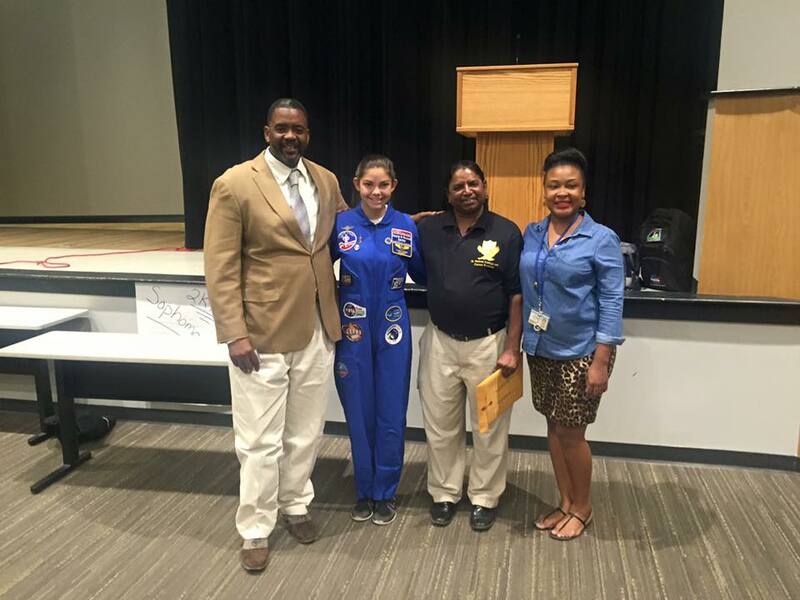 Baton Rouge, LA – In honor of 4-H National Youth Science Day, students at the St. Helena College & Career Academy received a surprise visit from 15-year-old NASA Blueberry Alyssa Carson on Oct. 10th. Alyssa, who has dreamed of becoming an astronaut since the age of three, had some very encouraging words for the academy’s 8th, 9th and 10th graders. Carson, who is an active NASA Blueberry shared with youth that she spends a substantial amount of time researching various topics on Mars. Her main goal is to be one of the youngest astronauts to go on a short mission to Mars, by the year 2020. As with many goals, preparation is the key ingredient and Alyssa’s long list of impressive accomplishments puts her right on target. Carson also advised youth interested in aerospace to begin training at NASA Space Camps. These camps provide simulated missions, engineer challenges, and sharpen leadership skills. She stated that she has already completed Space Camp Turkey, Space Camp Canada and will soon be one of the first to complete all NASA Space Camps in the world. Students were in awe, as Carson demonstrated with a basketball and string how far Earth is from Mars. The best analogy that Carson gave, was to think about 300 football fields. Certainly, that raised many questions and peaked a lot of interest throughout the auditorium. Article written by Nicolette Gordon, SU Ag Center Assistant Area Agent. Baton Rouge, LA – The Southern University A&M College System is inviting students to apply for the USDA/1890 National Scholars Program participation. The USDA/1890 National Scholars Program is a major effort of the U.S. Department of Agriculture and the nineteen 1890 Historically Black Land-Grant Institutions to award scholarships to students to attend one of the nineteen 1890 Institutions in any field of study in agriculture, food, natural resource sciences or other related disciplines. The USDA/1890 National Scholars Program will provide full tuition, employment, employee benefits, fees, books, and room and board each year for up to 4 years to selected students pursuing a bachelor's degree at one of the nineteen 1890 Institutions, which includes Southern University. Application DEADLINE Saturday, December 31, 2016. Click the following link for more information: http://www.outreach.usda.gov/education/1890/index.htm. 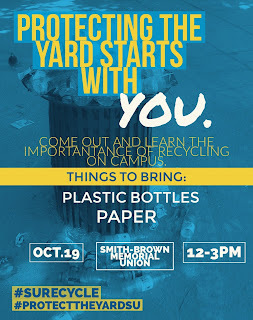 Baton Rouge, LA – Kalaia Tripeaux, a Southern University Urban Forestry major and the University's 2016 HBCU All-Star Scholar, will kick-off a University wide recycling initiative on Wednesday, Oct. 19 from 11 a.m. – 3 p.m. during the Annual Homecoming Student Health Fair in the Smith-Brown Memorial Student Union. 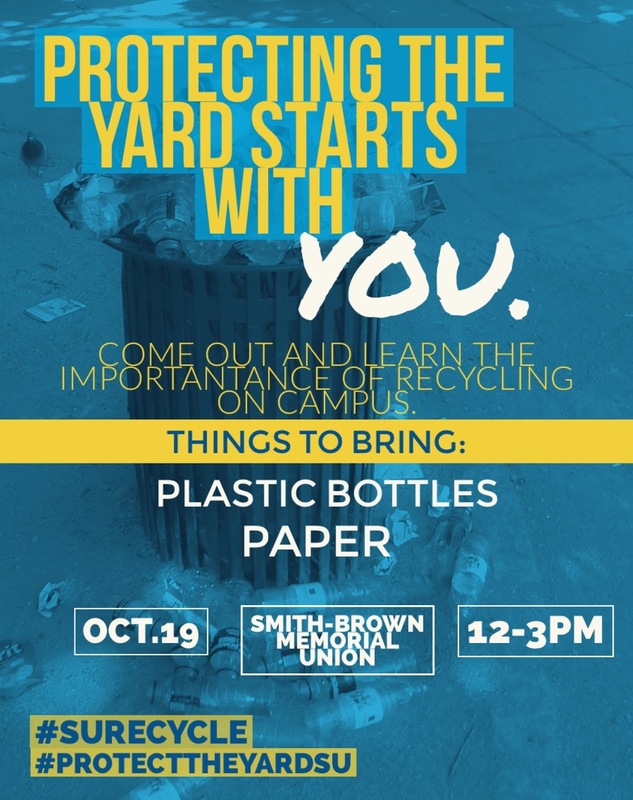 All Southern University students, faculty and staff are asked to bring plastic bottles and clean paper to be recycled during the event. Tripeaux is hosting the event as her campus initiative, which each HBCU All-Star is required to conduct. The 21 year-old Baton Rouge native was selected as one of 73 students from a national pool of 300 candidates to be named the 2016 White House Initiative on Historically Black Colleges and Universities (HBCU) All-Stars. The All-Stars, which are comprised of undergraduate, graduate, and professional students, are being recognized for their accomplishments in academics, leadership, and civic engagement. Members of the Scotlandville Promise Neighborhood team are, from left, Dr. Melanie Johnson, Political Science; Dr. Sandra Brown, School of Nursing; Dr. Bobby R. Phills, Chancellor-Dean of the SU Ag Center - College of Agriculture; Dr. Michael A. Stubblefield, Vice Chancellor for Research and Strategic Initiatives; Dr. Renita Marshall, SU Ag Center - College of Agriculture; Dr. Revathi Hines, Political Science. Standing on the second row are: Dr. Albert L. Samuels, Interim Dean of the Nelson Mandela College of Government and Social Sciences; Dr. Erma Borskey, Social Work and Dr. Diana F. Kelly, College of Education. Team members not pictured are: Dr. Patrick Carriere, College of Engineering; Atty. Chris K. Odinet, Horatio C. Thompson Assistant Professor of Law and Louisiana Bar Foundation Scholar and Dr. Tiffany Franklin, SU Ag Center - College of Agriculture. Photo by Chris Rogers, SU Ag Center - College of Ag. Baton Rouge, LA – Scotlandville is a historic community in North Baton Rouge, and the home of Southern University. 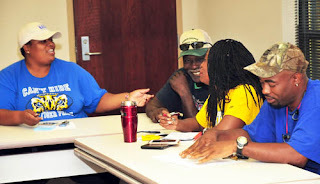 Southern University and A&M College, Southern University Agricultural Research & Extension Center, LSU, and other community stakeholders have partnered together to design and implement a community engagement effort known as the Scotlandville Promise Neighborhood. This initiative is designed to improve health outcomes, increase economic potential, reduce incarceration rates, and improve graduation rates and college and career readiness within the Scotlandville community. To support this effort, a team has submitted a proposal to the Promise Neighborhoods Program, a part of the White House Place-Based Initiatives, and if funded will bring over $30 million into the community. The initiative will focus its efforts in the Scotlandville community on Wellness, Early Childhood Development, K-12 Learning, College and Career Readiness and Family and Community Engagement. Under the charge and direction of the SU Office of Research & Strategic Initiatives, this cross – campus, cross disciplinary collaboration can truly make a difference. The Promise Neighborhoods Program is funded by the U.S. Department of Education. The program began in 2010 under the Obama Administration as a community revitalization effort that provides comprehensive, cradle-to-career support for students and families in distressed communities with a school centered approach. For additional information on the Scotlandville Promise Neighborhood initiative, contact Renita W. Marshall, DVM, and associate professor at the SU Ag Center, at 225-771-2242. Baton Rouge, La. - The Southern University Ag Center (Land-grant Campus) Chancellor-Dean Dr. Bobby Phills meets with the Farm Crew to discuss influential farm opportunities throughout the Land-grant Campus. 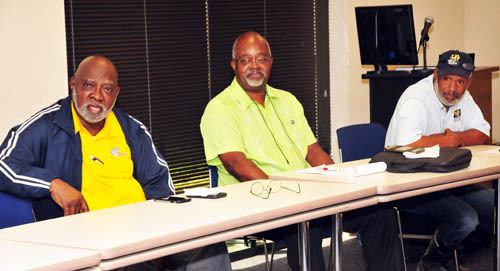 Dr. Calvin R. Walker, Associate Vice Chancellor for Research participated in the discussions. Baton Rouge, La. 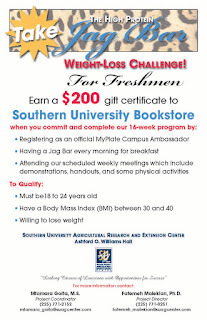 – The Southern University Ag Center is conducting a nutrition study entitled “University freshmen moving toward becoming ambassadors for healthy communities and future generations.” Freshmen students are hereby being invited to participate in the 16-week long study. We need at least 50 freshmen students for the challenge in the spring semester of 2017. 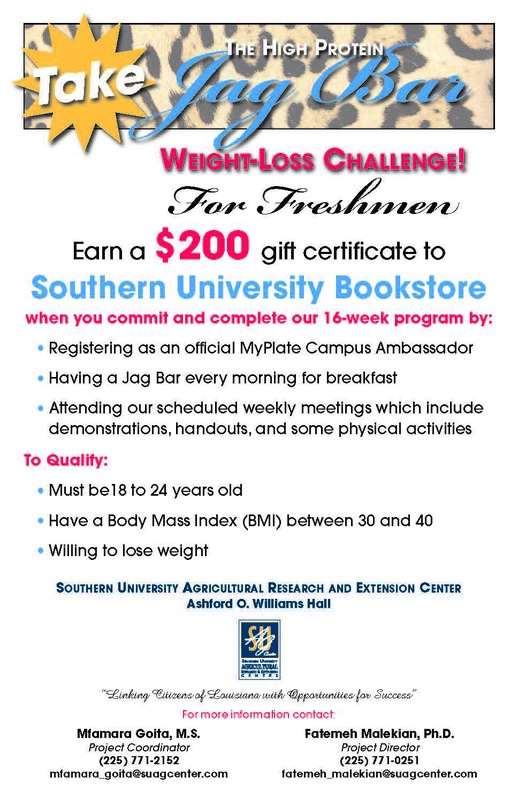 The weight loss challenge pays $200.00 and provides a Jag Bar for breakfast every morning to qualifying freshman students who register by the end of the Fall 2016 Semester. See attached flyer for full details. Baton Rouge, LA – The Southern University Baton Rouge campus will celebrate Homecoming the week of Oct. 16 – 22, 2016. 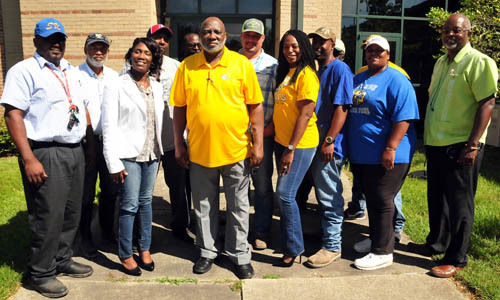 As part of the celebration, Dr. Bobby R. Phills, Chancellor-Dean of the Southern University Ag Center and the College of Agriculture, has invited all College of Agriculture students, alumni, SU Ag Center employees and the Center’s constituents to join him during Homecoming. Dr. Phills will host a “Meet and Greet with the Chancellor – Dean,” for College of Agriculture students on Friday, Oct. 21 at 12 p.m., on the front lawn of Fisher Hall. He will also discuss the “State of the Land-Grant Campus” with College of Agriculture alumni and SU Ag Center constituents at 1 p.m. on Saturday, Oct. 22nd in room 106 of Fisher Hall. Refreshments will be served at both events, which are free; however, the SU Athletics Department charges a $10 fee per vehicle to park on the Southern University Baton Rouge campus on game days. Parking passes can also be purchased from the SU Ticket Office for $25. The Southern Jaguars will take on the UAPB Golden Lions at 4 p.m. (on Oct. 22) with a Homecoming Pre-Game Show beginning at 2:45 p.m. The game day color for Homecoming is gold. For a complete listing of all Southern University Homecoming Activities, visit http://sujaguars.wixsite.com/suhc. For additional information on the SU Ag Center/ College of Agriculture Homecoming Round-Up, contact the SU Ag Center at 225-771-2242. Baton Rouge, La. – On October 11, 2016, the U.S. Department of Agriculture (USDA) joined youth, parents, schools, communities, and partners across the country in honoring National School Lunch Week 2016, as proclaimed by President Obama, a time to reflect on the positive steps our nation has taken to make nutrition a priority in every U.S. school. This also coincides with the month-long celebration of Farm to School Month, which recognizes efforts to bring local foods into schools and onto students' trays. A drone hovers over the crowd during the SU Ag Center's 2016 4-H National Youth Science Day. Baton Rouge, LA – Two hundred and ninety-three students from Southern University Laboratory, Scotlandville Pre-Engineering Academy, Park Ridge, J. K. Haynes, Progress and Ryan Elementary, Tallulah Charter, Kentwood High Magnet and St. Helena College & Career Academy schools attended the Southern University Ag Center’s 2016 4-H National Youth Science Day (4-H NYSD). The national event was held in the Cotillion Ballroom of the Smith-Brown Memorial Student Union on Wednesday, Oct. 5 on the Southern University Baton Rouge campus. This year’s experiment, called Drone Discovery, consisted of a hands-on, three part engineering design challenge which allowed students to experiment with fixed and rotary wing designs, explore the concept of remote sensing and dive into the world of coding for real-world drone applications. The event featured a drone demonstration by Garrett Edgerson, a choral performance by the Scotlandville Pre-Engineering Magnet Academy Choir and several interactive display stations on 4-H, Tobacco Free Living, Community Policing, Biofuel, the United States Department of Agriculture, Apparel Merchandising and Textiles, Animal Science, Healthy Living, Erosion and Gardening. Comedian and Max 94.1 FM radio personality, Howard Hall served as host of the event. Southern University Ag Center Chancellor – Dean, Bobby R. Phills, Ph.D.; East Baton Rouge Parish School System Deputy Superintendent, Michelle Clayton, Ph.D. and Gulf State Regional Director for the National Center for Appropriate Technology (NCAT), Rockiell Woods spoke to the students on the importance of science, technology, engineering and mathematics (STEM) and pursuing a college education. 4-H NYSD is the world’s largest youth-led science experiment, drawing nearly 100,000 participants in 2015. The national day is dedicated to engaging youth with science through a hands-on, interactive learning experience that gets youth excited about STEM. The 2016 activity was designed by Cornell University Cooperative Extension. The event’s national partners are HughesNet®, Lockheed Martin and U.S. Cellular. DJI, the world’s largest maker of consumer drones, is the national sponsor. For additional information about the Southern University Ag Center’s 4-H National Youth Science Day or 4-H activities, contact Tiffany W. Franklin, Ph.D., at 225.771.2242. Photos from the 2016 4-H National Youth Science Day are available here. Baton Rouge, La. - Secretary of Agriculture Tom Vilsack announced the start of a new U.S. Department of Agriculture (USDA) jobs program that will use the national apprenticeship system to hire new employees as agricultural commodity graders, a key role in USDA's mission to protect American consumers. The new program will also serve as a way to increase jobs for U.S. veterans. Baton Rouge, La. — The U.S. Department of Agriculture (USDA) announced that beginning today, October 4, 2016, many of the 1.7 million farms that enrolled in either the Agriculture Risk Coverage (ARC) or Price Loss Coverage (PLC) programs will receive safety-net payments due to market downturns during the 2015 crop year. "This fall, USDA will be making more than $7 billion in payments under the ARC-County and PLC programs to assist participating producers, which will account for over 10 percent of USDA's projected 2016 net farm income. These payments will help provide reassurance to America's farm families, who are standing strong against low commodity prices compounded by unfavorable growing conditions in many parts of the country," said Agriculture Secretary Tom Vilsack. "At USDA, we are standing strong behind them, tapping in to every resource that we have to help. So far in 2016, this has included creating a one-time cost share program for cotton ginning, purchasing about $800 million in excess commodities to be redirected to food banks and those in need, making $11 million in payments to America's dairy farmers through the Dairy Margin Protection Program, and reprogramming Farm Service Agency funds to expand credit options for farmers and ranchers in need of extra capital. As always, we continue to watch market conditions and will explore opportunities for further assistance in the coming months. For producers challenged by weather, disease and falling prices, we will continue to ensure the availability of a strong safety net to keep them farming or ranching." Nationwide, producers enrolled 96 percent of soybean base acres, 91 percent of corn base acres and 66 percent of wheat base acres in the ARC-County coverage option. Producers enrolled 99 percent of long grain rice and peanut base acres and 94 percent of medium grain rice base acres in the PLC option. Overall, 76 percent of participating farm base acres are enrolled in ARC-County, 23 percent in PLC and one percent in ARC-Individual. For other program information including frequently asked questions, visit www.fsa.usda.gov/arc-plc. The Budget Control Act of 2011, passed by Congress, requires USDA to reduce 2015 ARC and PLC payments by 6.8 percent. For more information, producers are encouraged to visit their local Farm Service Agency (FSA) office. To find a local FSA office, visit http://offices.usda.gov. For more information, visit www.usda.gov/results.